Want to connect with Sergio? 16 yrs. 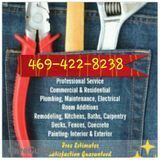 Experience with references upon request, to painting remodeling , fences, give me a call to schedule a time for free estimate.